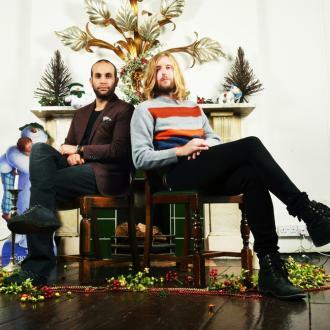 Former Razorlight drummer Andy Burrows teamed up with film composer Ilan Eshkeri to produce the single 'Light The Night' which served as the official soundtrack to 'The Snowman' sequel 'The Snowman and The Snowdog'. Accompanying this soaring number is a tear-jerker of a video featuring one little boy who wishes to be able to fly like the famous snowman in 'The Snowman and The Snowdog'. No matter how hard he tries, with his array of flight devices from helium balloons to a rudimentary cape, he simply cannot lift his feet off the ground. When a little girl who he is forced to play with takes pity on him and makes a wish on the star on top of the Christmas tree, everything changes. She finds his bed empty in the middle of the night and on his appearance in the morning, he is holding the tree star which he could not have normally retrieved by himself. The song has everything needed for a great Christmas song never mind a movie soundtrack. The tinkling introduction and classical instrumental throughout truly reaches the heart and the ever-building crescendo adds to the mystery and wonder that is this wonderful movie. This isn't the first Christmas effort from Andy Burrow; in 2011 he released the seasonal album 'Funny Looking Angels' which included the single 'When the Thames Froze' with Editors frontman Tom Smith. Burrows has called his current project 'a dream come true' and insists 'working with the same team who were responsible for the original film has been such a fantastic experience'. The original BBC sitcom The Office ran for 14 episodes from 2001 to 2003, and now 13 years later Ricky Gervais returns to his iconic character for a follow-up movie. Referring to the original series as a "BBC documentary", David Brent gets a camera crew to follow him as he makes a last-gasp attempt at achieving his dream of being a rock star. But instead of going on a reality show like everyone else, he hires a band and hits the road. David is now working as a tampon salesman for a firm in Reading, with a chucklehead colleague (Tom Bennett) who gets all his jokes and a coworker (Jo Hartley) who has a soft spot for his idiocy. Now he has decided to take all of his holiday and cash in his retirement fund to reform his band Foregone Conclusion with session musicians as well as rising-star rapper Dom Johnson (Ben Bailey Smith). 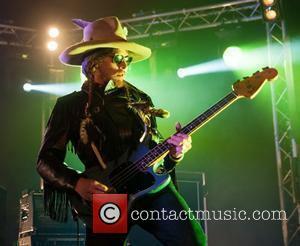 He hires a tour bus and heads off to a series of gigs in nearby towns, determined to embrace the rock-n-roll lifestyle. But without much promotion, the fans don't quite materialise. And there's tension within the band, mainly because they're all just here for the cash and are annoyed by David's antics. Of course, everything David does is excruciating. The rambling introductions to his jaw-droppingly inappropriate songs are accompanied by grimaces from his bandmates and the audience. The music is actually quite good, while the lyrics are simply painful (Native American seems like the low point until he kicks into Please Don't Make Fun of the Disabled). David is the only person on screen who doesn't realise how appalling this is. 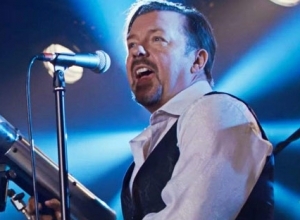 And yet, since the film is written and directed by Gervais himself, there's a strange sense of irony at work here, as if Gervais himself would like to be a rock star, and is using this film as a chance to ignite a side career. 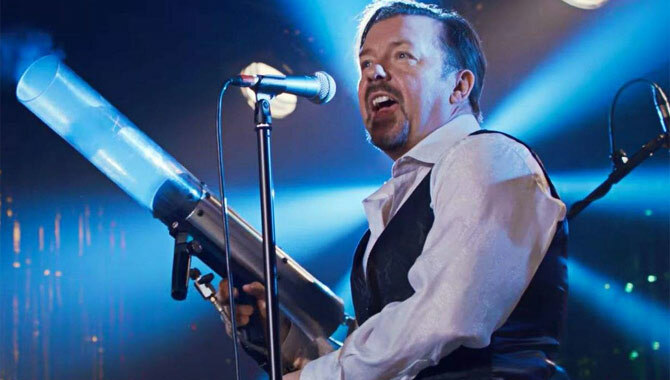 Since becoming infamous after appearing on the popular reality/documentary show, The Office, David Brent has been just dreaming of the day he can give up conventional work and live life on the road with his band Forgone Conclusion. After working his way up the ranks at the Paper Merchants Wernham Hogg, David was one of their office managers but now finds himself employed at Lavichem as a sales rep. In David's mind, he and his band will never be too old to make it and NOW is the time for them to hit the road and show the UK what they have to offer. With underwhelming ticket sales, Forgone Conclusion find themselves on a 'toilet tour' of the UK, not only are they far from playing the packed venues that David envisions for a band of their quality, they're also broke meaning David must withdraw his pension funds to finance the band. Joining the band on tour is rapper Dom Johnson who is also far from convinced that Brent has the lyrical skill to break them both to the big time. 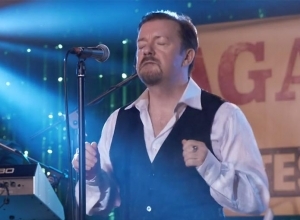 The UK was introduced to David Brent when the BBC decided to make a real life documentary that looked at the employees of a paper company called Wernham Hogg. Brent was the branch manager and was either loved or loathed by his employees. 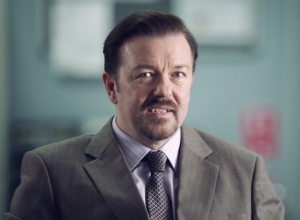 Since then, every office can identify a character they'd call their own David Brent. It's been 15 years since then and David is just as upbeat as ever. Now a sales rep for a company called Lavichem, the wannabe musician is still keen to pursue his once hobby and tour the UK. 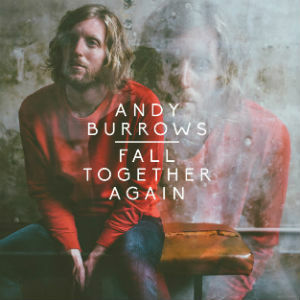 It takes a brave, some would suggest stupid, man to walk away from a band enjoying huge commercial success, but that is exactly what Andy Burrows did in 2009 when he departed Razorlight. More than just a man behind a drum kit, he co-wrote the ubiquitous 'America', an indication of his song-writing ability and ambitions. 'Fall Together Again' is his tenth album and will be supported with a handful of UK dates before he heads to mainland Europe. The opening 'Derwen' is a rich, string-laden intro that is all but instrumental, with perhaps the greatest compliment being that it should have been developed into a full song. Lead single 'As Good As Good' then sets the tone of fabulously melodic pop, which in this case is fused with a touch of funk. For those unfamiliar with him as a vocalist, Burrows also displays ability that fully justifies the decision to step out from the back of the stage. 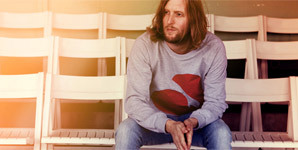 At softer points, he is similar to Badly Drawn Boy, but he possesses the ability to take his voice to the top range of a choir boy. It is further demonstrated on the breezy 'City To Coast', whilst 'All This I've Heard Before' has anthemic quality to continue the momentum. It's not unusual for records to load the better songs toward their front end, resulting in the album quality tailing off into mediocrity or worse. Not here. 'Who Are You Now?' 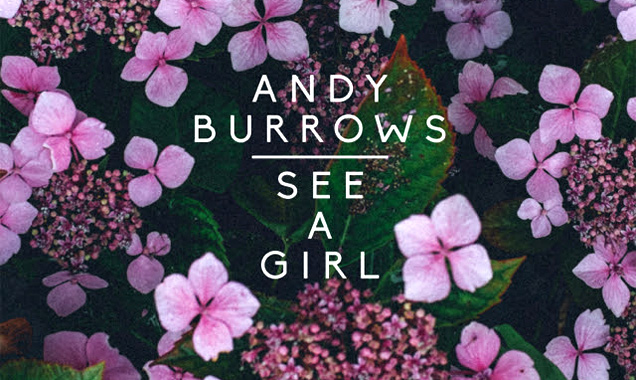 sounds like it could have been released in the New Romantics era, shimmering as Burrows hits an unexpected falsetto, before rolling into the warmth of 'See A Girl'. The bar is further raised with the emotive 'Watch Me Fall', which takes a more synthesised tone, yet the feeling it generates couldn't be any more organic. Burrows' encapsulating voice again takes centre stage on the stripped-back 'Hearts And Minds', whilst the closing 'Don't Be Gone Too Long' is an appropriate finale where the artist manages to turn melancholy into optimism. Given his past affiliations, you'd be forgiven for approaching this release expecting guitar based rock music, in which case you could be disappointed. Where Burrows hasn't let anyone down is in producing a proudly melodic collection of mature pop songs that, at its worst, is good and, at its best, is brilliant. The highly anticipated follow up to Raymond Briggs iconic penned classic 'The Snowman' was released to critical and public success, bringing 11 million people together to share the enchanting experience of 200,000 hand drawn images which brought the world's favourite flying snowman back to life. 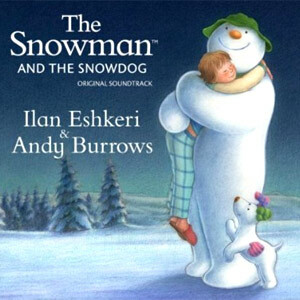 This season the Snowman is back with the release of 'The Snowman and the Snowdog Original Soundtrack' by film composer Ilan Eshkeri and Razorlight drummer Andy Burrows, allowing listeners to re-immerse themselves in the film's classic themes throughout their Christmas. What is immediately clear is that 'The Snowman and the Snowdog' soundtrack is not trying to re-create the 1982 minimalistic and intimate score featured in the original 'Snowman'. 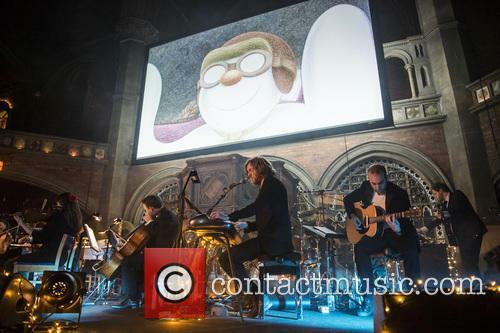 Instead, 'The Snowman and the Snowdog' features an ensemble of 60 instruments performed by the London Metropolitan Orchestra complimenting the impressive artistry of the film to make a mesmeric symphonic experience. Opening track, 'A New Beginning' encapsulates the emotional film's beginning; featuring violin from former Bond member Haylie Ecker, the track uses a collaboration of string instruments to create a repressed yet subversive feeling, immediately engaging the listener. Following track 'Christmas' manages to avoid the cheesy conventions usually associated with Christmas music and alternatively creates a mature and developed sound that utilises the mellow piano and string instruments. 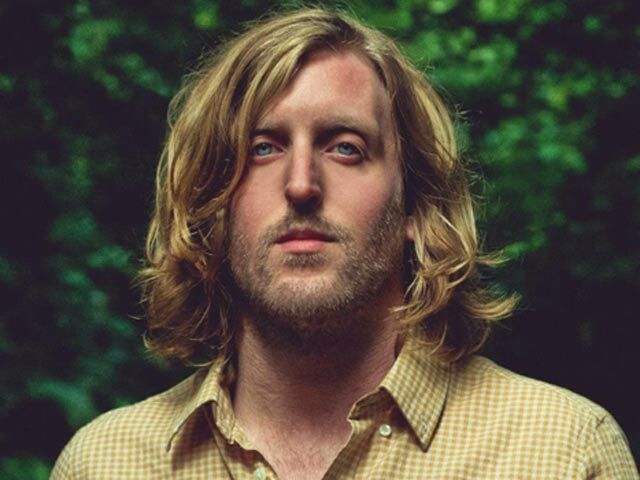 Former Razorlight drummer Andy Burrows is set to release a new single 'Because I Know That I Can' on October 8th 2012 which will be followed by his solo album 'Company' on October 22nd released through Play It Again Sam records (Arcane Roots, Editors, Seasick Steve, Zulu Winter). 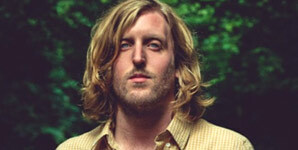 Andy Burrows' new single 'If I Had A Heart' is available as a digital download through Distiller Records and is taken from his unreleased solo album.